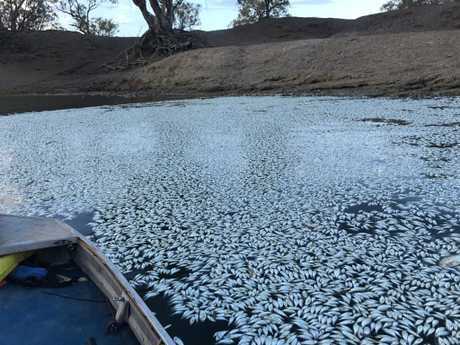 NEW photos have revealed the extent of a massive fish kill in the Darling River with hundreds of thousands of fish found dead. NSW Regional Water Minister Niall Blair told the ABC the latest fish kill in Menindee is "out of the Government's hands". The town, an hour from Broken Hill, has been at the centre of a continuing ecological disaster with Sunday's discovery marking the third fish kill in less than two months. Mr Blair told the ABC his Government was out of options after the "band-aid solution" of installing aerators along the river failed to keep fish alive. "It's starting again,'' local Graeme McCrabb wrote off the latest fish kill, posting new photos. Local Graeme McCrabb on Monday morning posted on social media of floating dead fish in the weir pool at Menindee. "There are lots of yabbies crawling up the bank … they must be suffocating," he told AAP. "It's a shame." 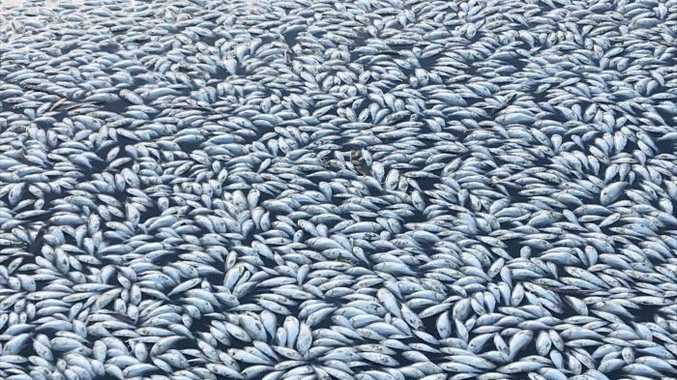 Mr Gregory said the latest fish to die would have likely been survivors from previous events. Central Darling Shire general manager Greg Hill, who is in charge of the clean- up, fears the latest mass kill could be as large. "I was advised the sudden drop in temperature makes it conducive, unfortunately, for the fish to be deprived of oxygen." Federal Labor leader Bill Shorten said the Murray-Darling was "facing the makings of an ecological disaster".